I currently teach learn to run 5km clinics as well as 1/2 and full marathon clinics. Before I'm done running marathons, I'd like to finally hit 3:20. I run because it is one of the best stress relievers. When I tie up my running shoes and go for a run nothing else matters. When I run it is my time, I'm not watching the clock, hurrying to be some where or listening to someone bark orders. During my run I solve the world's problems, come up with creative ideas — most of which will never see the light of day. That's why I run. One of my best marathon memories was when I qualified for Boston the first time at the Detroit Marathon. I remember the whole race looking at my watch wondering if I was going to be able to keep my time. As I neared the finish line, I glanced down at my watch and saw I had done it. The final 100 metres I saw my family and I remember yelling to them "Pack your bags, we're going to Boston." I floated on air for the next week. 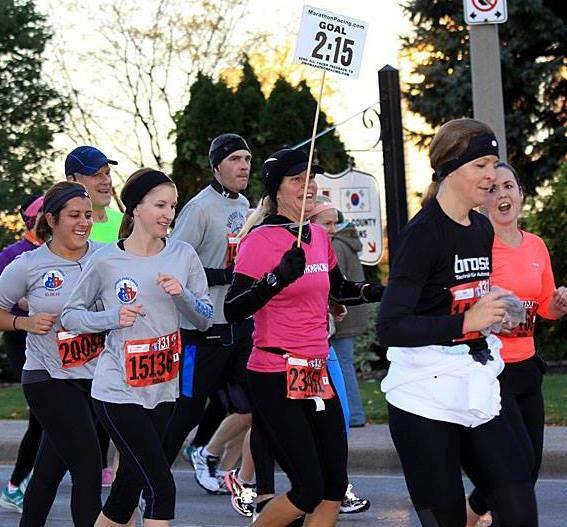 I pace because I love sharing my love for running with other people. I really enjoy helping people achieve their goals. 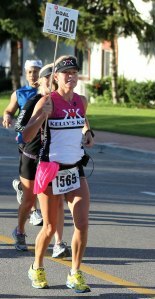 And, even more importantly, I love helping people realize they really can conquer the marathon. 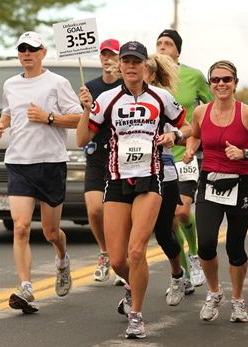 One of my favourite pacing experiences was Pittsburgh Marathon in May 2009. I started off with a large group and over the first 10 miles I started to lose about half of the runners. Many found the pace too slow or too fast so they went on their own. A group of about 10 runners stayed with me for the majority of the race. When times started to get tough, I'd tell whoever was struggling to come up next to me and I'd talk to them. Or they'd yell at me 'Pacer Kelly, I'm having a hard time." and I'd run back and talk them through it. The runners all stayed with me and at the end of the race everyone waited around to get their snacks and beverages and then we gathered around and everyone hugged each other and thanked one another for running together. It really was an incredible moment. People who run with me in my pace group should be ready for someone who likes to talk -- just ask my runners in my clinics. I know what it feels like to hit a wall and I also know what it feels like to struggle trying to meet your goal. I try to make it my personal goal to keep everyone in my group together as long as possible. Race day is my favourite day and I love sharing it with other runners. I run an even-paced race. I also stop at water stops at every three miles. I walk the water stops so everyone can get a good drink of water and then we continue on. My biggest tip for runners is please take the distance seriously. If you haven't done your training (your long runs in particular) you're going to struggle on race day. You have to respect the distance.